My birthday isn’t far away, a month exactly…the top summer items on my list are: shorts, bikinis and crop tops. I tried on this crop top recently in Topshop and considering the reasonable price, it’s a great fit and so versatile! 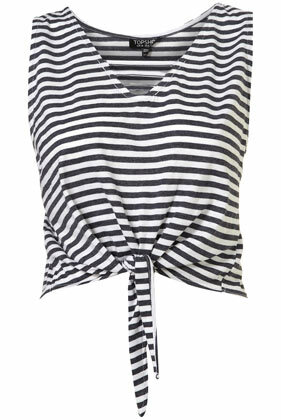 It is a Stripe Knot Crop available for £14.00, navy blue and white. Throw it on with those high waisted denim shorts, go on! A simple but definite must have today. To all those students, don’t forget your student discount of 10%! Now…who knew Marks & Spencers Fashion Limited Collection range was so darn trendy! It’s totally in trend with ‘Paint Pot Graphics’ and ‘Luxe Lounging’ at reasonable prices with amazing quality! Now I could post something for every day of the week from their collection so check it out at: http://www.marksandspencer.com/Limited-Collection-Womens/b/43019030?ie=UTF8&intid=gnav_women_brand_limited-collection. But for now I have chosen this Abstract Print Gathered Blouse. Great for day wear and evening wear, with a twisted front to give any outfit a stylish look. It’s £29.50 and available in this unique ‘tangerine’ colour, start collecting those pastels ladies!